In his own time, Houdini was as identified with his "East Indian Needle Trick" (or just the Needles) as he was with his iconic escapes. 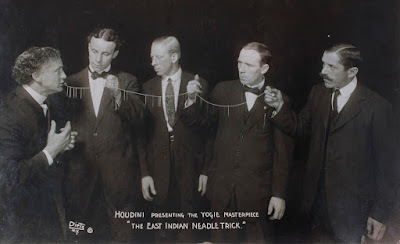 While the Needle trick did not originate with Houdini (it goes back to 1813), by all accounts Houdini's dramatic and very physical performance of the effect was second to none. In the effect, Houdini would take a collection of needles and tread into his mouth and swallow them with a glass of water. Houdini invited people onstage to examine his mouth with a flashlight to prove that the needles and thread were indeed gone. He would then dramatically regurgitate the objects, but now the needles would be strung across the knotted thread. Houdini's appears to have first performed the Needles in Kansas City in 1899 during his early days of success on the Keith-Orpheum circuit. He went on to performed the effect for the rest of his career, even doing it in the massive 5,200 seat Hippodrome Theater in New York. It didn't matter that the small needles couldn't be seen in such a large venue. Seeing Houdini doing this classic was thrill enough for the audience. It's sometimes pointed out the irony that Beatrice Houdini died on a train as it arrived in the town of Needles, California.